What is CompTIA A+ 220-902 Exam and why you need it? In order to gain knowledge in networking and operating systems and to build exception careers in information technology, CompTIA A+ 220-902 Exam occupies a wonderful part. CompTIA A+ 220-902 is a certification exam that covers PC hardware and peripherals, networking issues, mobile hardware, and troubleshooting. This exam set a great foundation for your IT career and a successful line in networking. Why you need IT Certifications? Before going in-depth about the features and the pros of the information technology and networking certifications, first, it is essential to know what the meaning of computer networking and network security is. Computer networking is a discipline in engineering that determine the interfacing two or more computing devices with each other through a proper communication channel. Computer networks are usually built with a combination of software and hardware. Likewise, when it comes to networking security, it is the practice of preventing and protecting illegal invasion in the business network. Large organizations have thousands of devices in a network; however, a lack of network security issues will result in huge chaos. Some of the common threats of network security are a virus, worms, spyware. When the business has a network that has no immune to these attacks, then the corporate has a potential risk of falling victim to data theft and sabotage. Therefore, network security is important than ever. However, your network security cannot be improved without having the best network security professional. 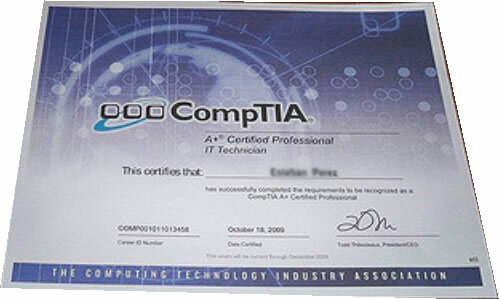 These professionals earn certifications from networking exams like CompTIA A+ 220-902whodoes a multifaceted job. They maintain and integrate corporate WAN, LAN and server architecture. A+ certified professionals are highly responsible for implementing security plans and constantly monitor the networks from malicious threats. But, what is the curriculum you need to cover and what topics you should be familiar to be CompTIA A+ certified professional? CompTIA A+ 220-902 exam majorly focusses on installing and configuring major operating systems like Windows, Android, iOS, Linux and Apple. However, you need to get familiarized with a multitude of aspects like mobile hardware, networking and troubleshooting, PC hardware and peripherals and extended knowledge of network security. Users can utilize plenty of materials available online. In addition, the CompTIA website provides training on various aspects and offer study materials to master in the exam. Individuals who wish to have classroom training can make use of their online session. After the completion of the training, you can take up a number of practice to test your understanding and to have a better perception about the CompTIA A+ 220-902 exam objectives. Successful completion of your exam can help you advance in your career, strengthen your IT skills and become a more qualified employee. Apart from these, there is a multitude of benefits of earning CompTIA A+certification. In the latest research about networking investments conducted by top networking team of 700 networking experts, the results reveal that every organization requires highly skilled networking infrastructure professional to handle the increasing networking challenges and security issues. So, individuals with these kinds of certifications are highly in demand. Easy to get hired – An IT professional skilled in multiple areas of networking will always be on the top of the list, and they will have more priority during job recruitments. In this highly competitive world, where the amount of student graduated outweighs the amount of job, so unless you are a skilled professional with sufficient knowledge in the industry, it becomes hard to get hired. Earning certification in CompTIA A+will place you in a better position and offers greater chances of getting hired. Job Retention – With the tremendous advancement in the industry of technology, more organizations are turning towards robotic automation to cut cost the human efforts and make most of the system automized. People with a minimal level of skills have more chances of losing jobs in this volatile world to meet the economic scenario. So it is always advisable to enrich your skills in various aspects and earn industry standard certifications like CompTIA A+. Earning certifications portray yourself as a competent player with skills and knowledge and enhance more chance of staying in the company for long. Promotions –When you are looking for a promotion, ensure that you are a qualified person for availing promotions. Promotion expects pre-requisites and is attainable only if you have extraordinary skills in your industry or have relevant certifications like CompTIA A+to show that you are more qualified. Many of the employers inevitably look for good certifications with sufficient skills to offer promotions to the employee. So earning this certification give more prospects of climbing the growth ladder and provide higher earning potential. Professional credence – Salaries are highly individualized and depend on multiple factors that are really complex to understand. However, when you want to increase the salary averages, CompTIA A+certification provide an extended role. People having certification are found to be more valuable, and these certifications add professional credibility to the individual. Earning one or more of these kinds of certificates demonstrates your motivation and dedication towards the industry and eventually possess a successful growth to your career. CompTIA A+ 220-902 examrequires learning and applying an abundant amount of information. This certification is best suited for entry-level associates and a great foundation to set a career in Information technology and networking. So, why you still want to wait for the opportunity to come to your way. Go grab the opportunities and make a successful career in IT.